Most middle school students’ eyes pop wide open when they hear that 90% of the seafood we eat in this country is imported, particularly when they learn how much seafood we harvest annually. They dive into the conversation as they begin to see the implications of that dynamic on the seafood they eat. 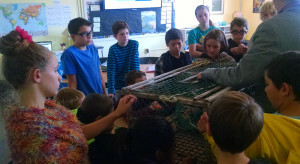 Middle school students are curious about their connection to natural resources and the food they eat, and they like to hear that their personal choices matter. One Fish Foundation visits provide an interactive, hands-on forum to explore issues ranging from gear type, to abundance, changes in the Gulf of Maine, and how their decisions have an impact on local seafood resources. Engage in interactive discussions about how they can use this knowledge to make informed decisions about the seafood they eat. If it was farm raised, were any hormones or antibiotics used? Is this an abundant species? One Fish Foundation will work with you to customize a lesson plan to tailor content to meet students where they are in your curriculum. Depending on the age group, we can have a mix of hands-on demonstrations and a few slides to illustrate different gear types and ways to minimize bycatch. All of this information is colorfully wrapped in stories that make their connection to seafood, whether like to eat it or not, come to life. Students leave feeling empowered knowing their decisions make a difference.